The happier the donkeys are, the better their charisma and thus the happier they can make us. Especially when donkeys are used to therapy depression or autism, the happier they are, the more successful the healing with donkeys is. 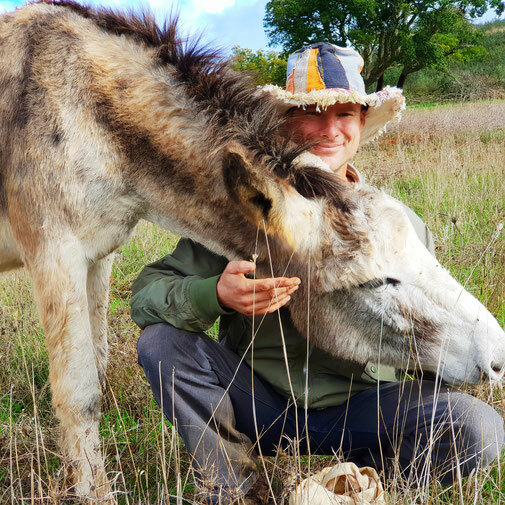 I have suffered for many years under very deep depressions and with the donkeys and good nature I am completely cured and do no longer need any psychotropic drugs, which didn´t help really. 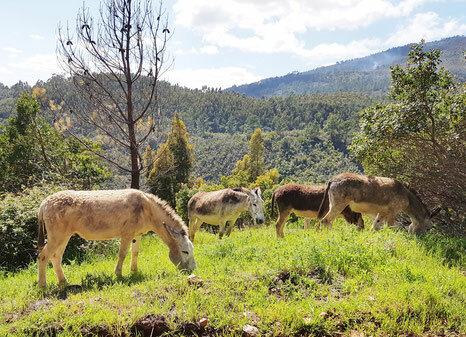 All people including customers from the Happy Donkey walks always said that my donkeys are the happiest donkeys they have ever seen. During the last 3 years I found that very sad. All these sympatic people who made this comments during this time never have seen truly happy donkeys, in my opinion. To make donkeys really happy is not really an art or magic. All you have to do is respect their natural needs and take the few things into account. Donkeys come from the semi-desert and are nomads. They wander about 25 kilometres a day to satisfy their need for food. 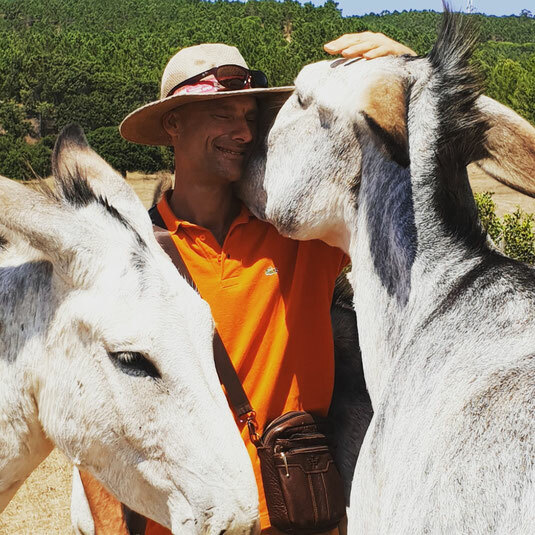 I had the happiest time with my donkeys when we were on the road for 3 years to find a good place to live. Every day we walked about 25 kilometres. The donkeys carried my luggage and sometimes also me, if my foot hurted too much. In the evening they still had enough energy to play with their babies. That was great. The donkeys had the best charisma of all the yers we are already together. So a sufficiently large property is needed to get the best energy from the donkeys. So far I had in the past years for my donkeys areas of 1 hectare up to approx. 500 hectares available. From 100 hectares on they become to be truely happy. This should be used as a guideline. 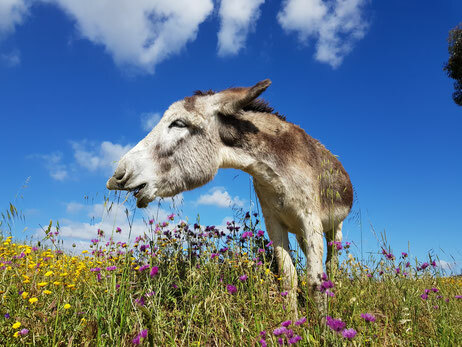 Donkeys need species-appropriate food to be healthy. My experience shows me, dry grasses, not too rich in protein, as well as shrubs and also certain trees are the best for them. From the river cane you see on the photo they shouldnt eat to much. Very bad for them is conventional straw which is nearly without of nutrition and full of chemicals. And if you serve straw, you have to complement with grain so asure the necessary proteins are available. Grain is not good at all for donkeys. Best is if the space is big enough so they can run and find a lot of wild herbs too. And you can complement with hay and good straw. Simply a huge meadow, without bushes, trees or anything else, who can feel really happy there? Nobody! So do the donkeys. 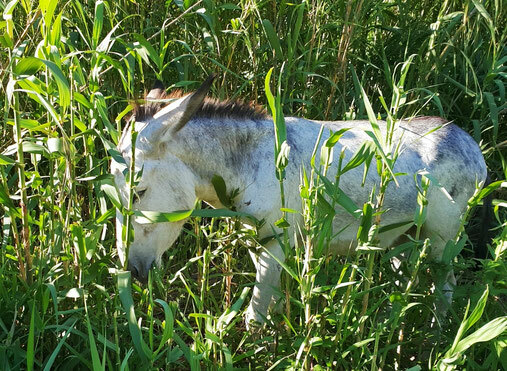 Donkeys love to discover new things, have the shade of trees in summer and nibble on scrubs and trees. If you gonna visit us, you also feel much better in a nice terrain. And last but not least, specially for the donkey therapies which I would like to offer, a nice terrain is essential. - Healing! Of man, animals and our planet. - To give people the opportunity to heal in and with nature. - To provide the right circumstances for people to find their way back to nature. - To make people really happy. - To offer a contrast to normality, the mostly destroyed environment, with a natural place. - To create consciousness for bring back our planet Mother Earth into order. - To offer donkey therapy, e.g. for depressions, autimus, anxiety and other mental disorders. - To offer a place for encounter to all who want to stop suffering. - To be a place of inner reflection and meditation in silence. - To place an area as large as possible under true protection of nature. - As most as possible clean air, so that the body takes a deep breath of its own. - As clean as possible water. - The vegetation should be as good as possible, mixed forest with nice flieds, especially wanted is that old trees are also present. - Natural dwellings with good energy, they are very easy to create and without an huge ammount of money. - Beautiful gardens in permaculture and forest gardens. - Walking paths where you can also walk barefoot. - A building with good acoustics for healing music and singing. - give true happiness and peace. In short, the reconnection of us with the universe. Sure this does not work with dogmas, hierachy and self-proclaimed or whatever gurus and leaders. Be welcome to become part of this beautiful project.